If you’re on a gluten free diet and have never tried Ethiopian food, you are depriving yourself of a meal where utensils are replaced with injera, a thin spongy bread made from teff flour (an ancient and gluten free grain). Celiacs beware: although the tangy, crepe-like bread is traditionally made solely of teff flour, many Ethiopian restaurants mix their teff with wheat flour to cut costs, rendering a naturally gluten free item inedible for those with gluten intolerance. It’s a good thing Moya restaurant in SOMA offers gluten free injera (teff flour only) for $2 extra. Now those of us on the gf diet have somewhere to enjoy the rich and unique flavors of traditional Ethiopian food without fearing for our intestinal villi. Choose a selection of vegetarian, vegan and/or meat options to be served atop the large, flat injera and expect to get your hands dirty. Most of the items on Moya’s menu are naturally gluten free, and the wait staff can let you know which items are not safe. 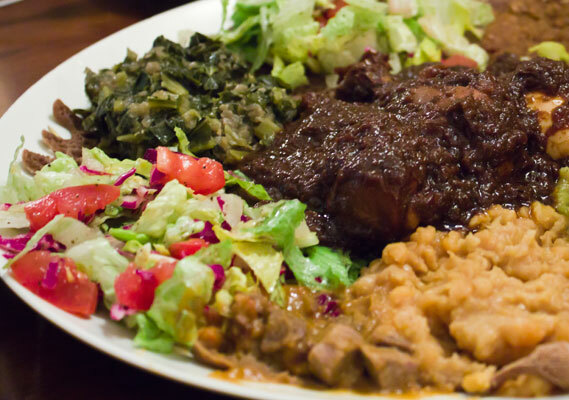 Featured Dish (served 3 people): Vegetarian combination along with Ye Doro Wot (marinated chicken sauteed in a rich sauce) and Bozena Shuro (roasted chickpeas slow cooked with traditional spices and strips of sirloin). Wow, Thanks so much for the update on this, I hadn’t heard of their closure.. Unfortunately almost every Ethiopian place in the city uses wheat flour mixed in with the teff… I called just about every one about a year ago. Would be worth trying again though! Moya is currently closed due to a fire, but we plan to re-open in the same neighborhood soon, and we’ll still have gluten-free options available on our menu. We’re so sorry to hear that! Do you have an approx date that you plan to re-open? We miss your amazing food! We just reopened at 121 9th st. SF,CA b/w Mission and Howard. Different menu, but still offering gluten free options.